LONG EXTENSION This premium full motion sliding and swivel TV mount extends 28 inches and pivots / swings right or left for optimal viewing. The 28 inch extending arm will allow a 55" TV to pivot a full 90 degrees without hitting wall. 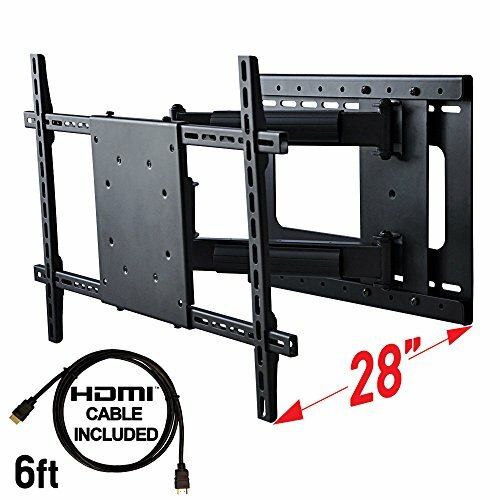 Works well as a corner TV mount or for centering on the wall between studs. GREAT FEATURES The most unique feature of this mount is the right to left adjustment capability.. Maybe you do not like the position of your TV on the wall. Simply move the sliding arm left or right on the wall bracket up to 14 inches. Voila, now it is perfectly centered on your wall and or perfectly positioned in the corner. Movement is easy with this Swivel TV Mount, simply push or pull your TV to the desired location, and it will move easily without tools required. With up to 180 degrees of movement, your TV can be viewed from any angle. The post installation leveling feature will insure you have a perfect installation every time; even if you mounted it crooked on the wall. Easy to use built in cable management is included for a clean look and will prevent pinching / breaking of your audio video and power cables. DOES IT FIT - Fits all Plasma, LCD, and LED TVs with a mounting hole pattern (VESA) between 200x200mm to 600x400mm. This means it can fit TVs from 32 all the way up to 70 inches in size. Please confirm for your televisions mounting hole pattern or VESA size. SPECIFICATIONS: - Swivel arms slide right and left up to 12 inches minus 5 degree and plus 15 degrees tilt - Pivots up to 180 degrees - Extension: 3.0 inch to 28 inches - Designed for dual stud 16 inch on center studs or concrete - Maximum TV weight: 80 lbs - Includes all hardware for installation to wood stud or concrete wall. Extra heavy duty articulating arm extends 28 inches away from the wall yet retracts to a slim 3.0 inch profile. With a 28 inch extension and a single pivoting point you can swivel a 50 inch 90 degrees in either direction without hitting the wall. Ideal for when the placement of your studs is not in the center of the location of where you want your TV to be placed on the wall. Also works well for getting a perfectly placed arm horizontally closer to the corner of the wall or farther away. Room Correction / Room Centering allows you to adjust your TV to your liking - even if your studs are not. You can slide the entire TV mount left or right to find the correct position for your TV. No longer do your studs decide for you. Post installation leveling allows you to adjust / level this mount after it is installed. Simply pivot the TV while it is still mounted on the wall to your liking and tighten in place. This mount installs on two 16 inch on center wood studs, concrete or masonry with the provided hardware. This mount is not recommended for installing directly onto drywall. This mount will fit most TVs from 32 to 70 inches in size and weighing up to 80 pounds. This mount will also fit many 32, 42, 55, 60 and even some 70 inch TVs. To make sure this mount will please verify your VESA size. If you have any questions about this product by Aeon Stands and Mounts, contact us by completing and submitting the form below. If you are looking for a specif part number, please include it with your message.